We go through the canal tomorrow so all the little jobs need finishing off today. We are going through in one hop which means we finish up on the Pacific side at about 2 am looking for a mooring somewhere. Despite the fact that the owners of the boat have been through the canal twice so far, they are still a little nervous. Things can go wrong when the massive locks are filling and emptying, that can damage the boat or worse. 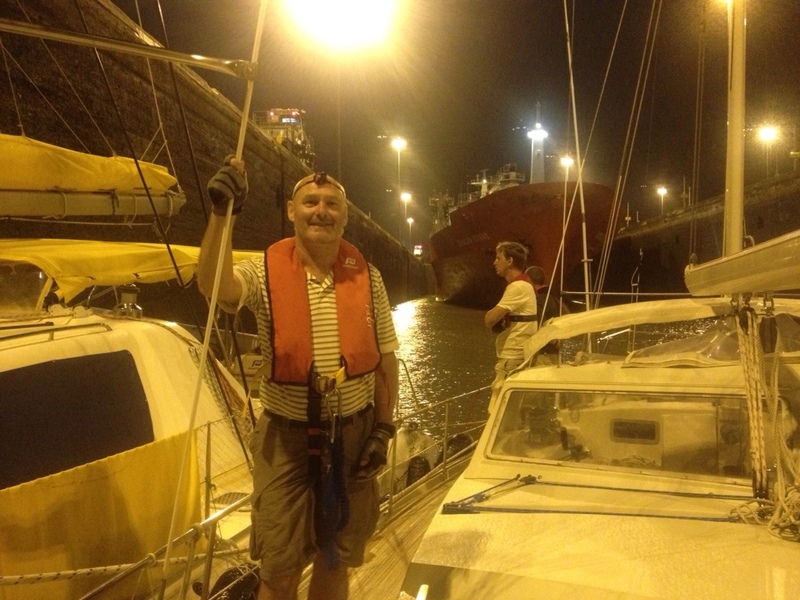 I am looking forward to getting on the move so the next week in Panama finalising provisioning and doing another raft of last minute maintenance and checking of spares will see me champing at the bit to get moving and sailing the boat. There is a bit of a fishing competition shaping up. Myself with a lot of fancy lures that I have sourced in component form and rigged myself, versus a long thick line with the finger of a marigold washing up glove and a hook. I was very happy yesterday when we managed to install a rod holder for my gear aft on he port side. We just need to get the rest of the sushi kit in Panama and get catching and noshing. The trip throught the canal proved very eventful. We left the marina in a force 8 gale which even made unberthing quite difficult. On the way across the big inner harbour we discovered that the engine would not deliver more than 1800 rpm which meant that we could only make 2 knts into the headwind. We had a couple of miles to motor before reaching the anchorage where we had to wait for our advisor who helps pilot you through the canal. While we were waiting for him we tried several things to see if we could make the engine perform properly.Unfortunately none of those worked, but fortunately the wind was behind us for the transit and off we went. The whole thing is an amazing feat of engineering. There are three locks on the way up. You share a lock with a merchant ship which doesn’ t fill the whole space. In our bit on the way up there were three yachts, a catamaran and two monohulls. You all get joined together in a sort of raft and each corner of the raft is tied to the top of the lock. When they start filling the lock there is a lot of turbulence and you need to work as a team with the people on the other boats to make sure you manage all the lines so that your raft stays off the lock walls and doesn’t spin around. As you go up you are rewarded with better and better views of the Atlantic coast dropping away beneath you. 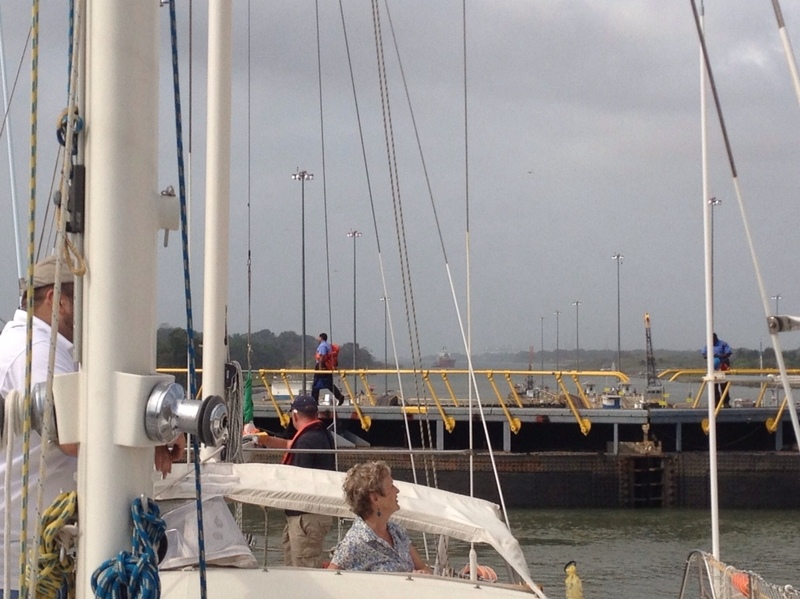 At the top of the locks on the way up, you emerge into a very big lake called Lake Gatun. The channel was marked all the way through and it was dark before we arrived at any of the down locks. I think there were four of them, which we transited uneventfully. On emerging we continued further down the channel to our anchorage at La Playita. At La Playita we are at anchor about 400 yards outside the marina which makes everything quite difficult when it comes to shopping and socialising. There have been lots of jobs to do on board in final preparation for setting off. The four major ones so far have been : reprogramming the instruments that record how much battery power remains and how well the generator is recharging the batteries, fixing leaks in the rubber dinghy, fixing a faulty switch for lowering and raising the anchor and fixing a useful little instrrument that measures the amount of anchor chain that is outside the boat. All those have gone well and the engineer showed up today to service the engine and hopefully fix the faulty turbo which is restricting our power. The other thing that happened today was that we moved to a mooring in Balboa Yacht Club. That means that we are serviced by a little launch that brings us in and out so no need for the dinghy for now. Once we leave here, there are no more marinas and our only means of reaching land will be the dinghy. Also here we have internet access which is why I am bashing off such a long post. The mooring is interesting. 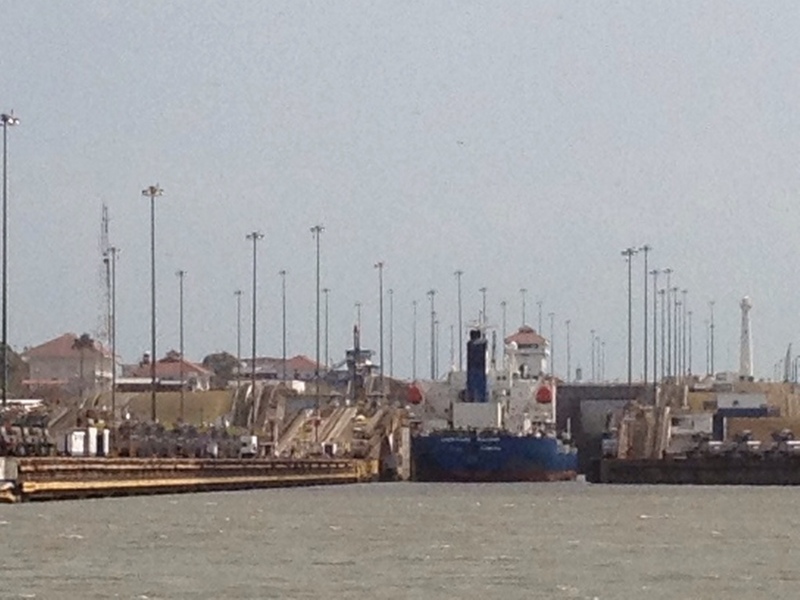 We are only about 100 meters from the main shipping channel exiting the canal into the Pacific. We are also only a few hundred meters downstream of the Bridge of The Americas. The photo shows a little of what it is like. Tomorrow we finish servicing the engine and get more provisions. We are trying to provision the boat for about 4 months, so there is food stuffed everywhere. Having said that each cupboard or locker or store under the floor has a number and a corresponding list of contents which are listed on a laminated sheet, so if you are the cook, you should be able to find things without continually asking. This is the season for doing this passage and a lot of yachts and catamarans are gathering here to make the crossing to Australia or New Zealand. 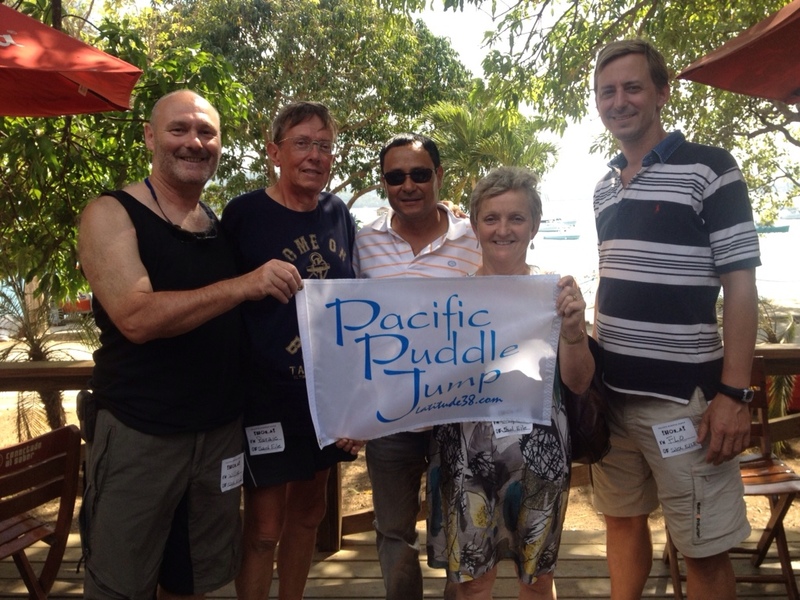 There is a sort of social group called ‘ The Pacific Puddle Jump’ which aims to offer support and organise socials along the way. We are signed up to it and came to a party to kick it off here on Saturday afternoon. We got our flag and had our picture taken. I will try to do a final post before we cast off. After that posts will depend on the availability of internet. I hope to keep an off line diary and upload it when I can. With a bit of luck, we will be on our way in a few days. « On the starting line for a big adventure! Sorry I didn’t manage to wish you bon voyage in person before you left – I hope you arrive safely at the other end having had the trip of a lifetime! 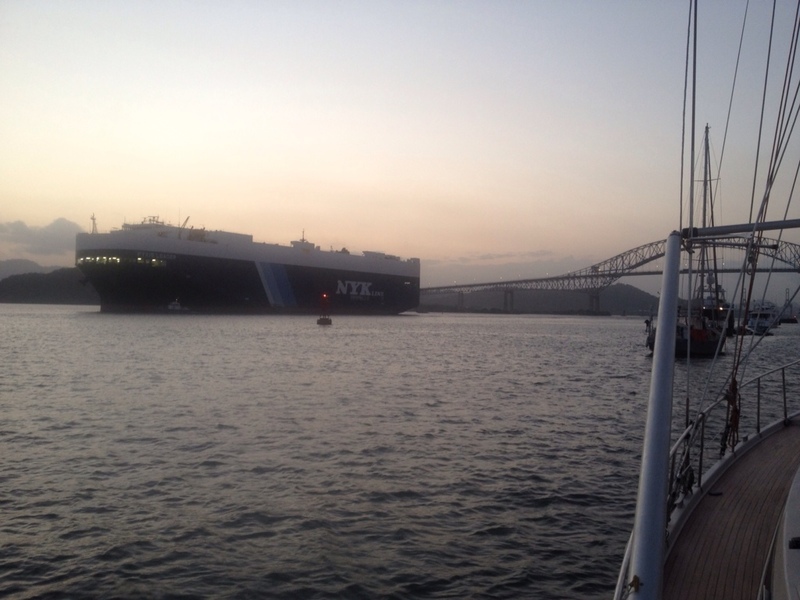 Your blog/pictures brought back many memories – the locks, Lake Gatun, Balboa yacht club (which had recently burnt down when we were there), the bridge & the ****ing great commercial shipping vessels that you rub shoulders with in the locks! I also laughed to hear that you are marigold fishing too! It will work! Thanks Bill. Trolling has not been as good as I hoped but no other yachties are catching. Planning a day game fishing here in Galapagos if I can fit it in.